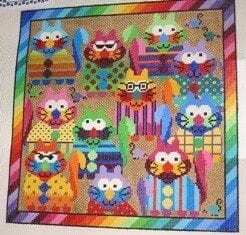 This great canvas is bright happy and FULL of cats. There’s actually some mice in here too but they’re pretty much trying to get the heck out of there. If you love bright and happy, this is the canvas for you. This one is 13 ct., the painted area is 12 x 12″. There’s a great rainbow border around it too. This is actually a good canvas for anybody with a short attention span, a lot of thread stash or even a younger starting stitcher. There’s so many things going on in color that you won’t get bored doing the same thing over and over.